There's an African proverb oft quoted that takes a village to raise a child. We would like to expand that concept to also keeping them safe, irregardless of their age and to include non-humans into the mix as well. 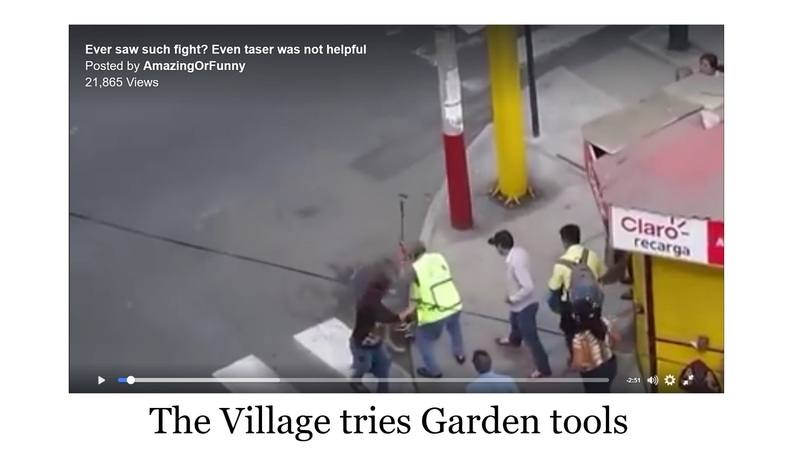 We are the Village. 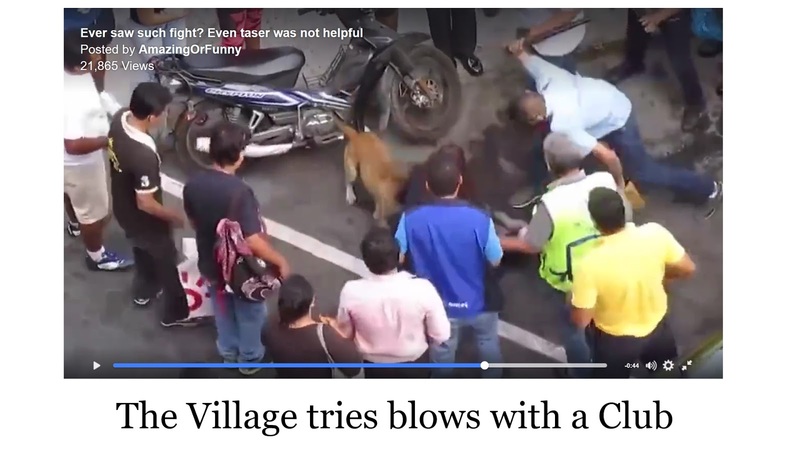 These days, it's not safe to play in the village anymore. We all used to be able to walk down the street, ride bicycles, and dally with the daffodils with nary a worry, but this is a new world. No neighborhood is immune to the problem with pit bull attacks, despite what pit bull expert Bronwen Dickey thinks......that it's only elderly whites. Those who favor BSL are a diverse spectrum, you will even find both Democrats and Republicans who support, and yes, oppose the concept of regulating the type of dog involved again and again and again in a serious, difficult to disengage dog attack. 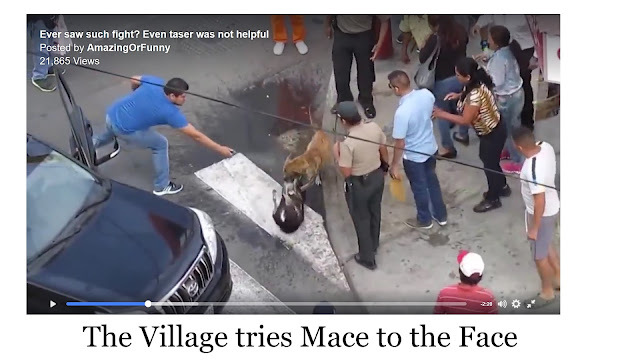 The task of freeing a human or animal victim out of the grips of their non-locking but nonetheless very strong jaws and even more tenacious brains can take the heroic effort of one or several people. There are many of these videos out there, this one happens to be a rather excellent example showing a variety of methods of "try". How many people and how many means did you witness in the 2:56 minutes of the fight between a stray pit bull and another stray cur mutt this film captured? 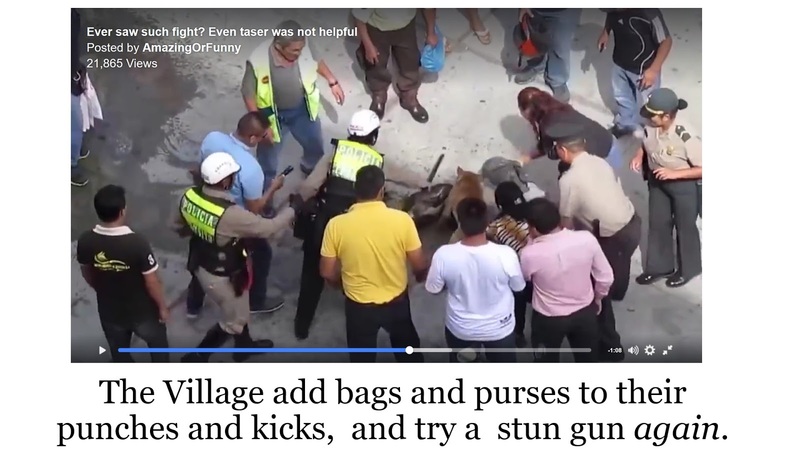 Sometimes, it takes the effort of an entire village to make pibble let go. 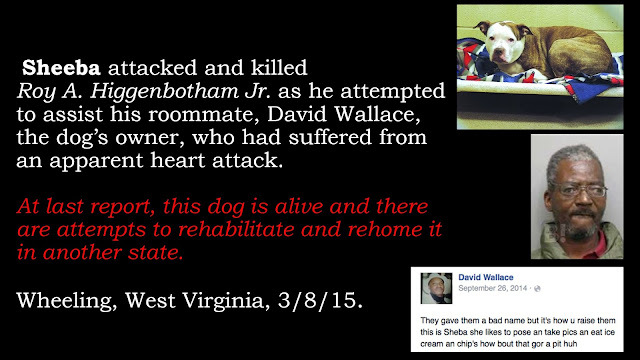 May 4, 2015 Sharpsburg, PA: Even the pit bull's owner could not get the attacking dog to stand down. 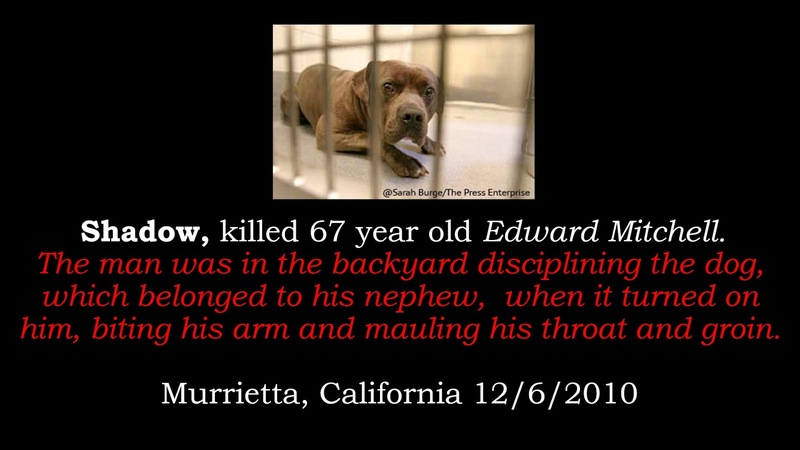 Instead, the dog's owner would need a crowbar to pry the dog's jaws open so it would release the 8-year-old girl's arm. 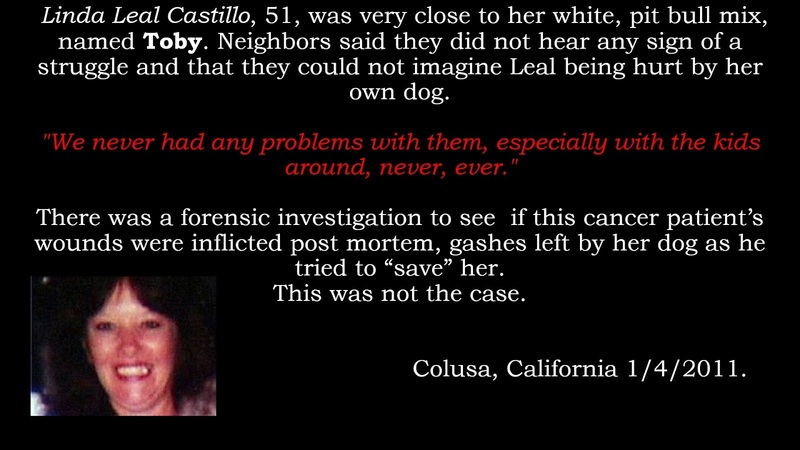 6/06/2016 San Bernardino, CA: It took several neighbors to finally pull the dog off the woman who suffered a serious bite wound to her leg. 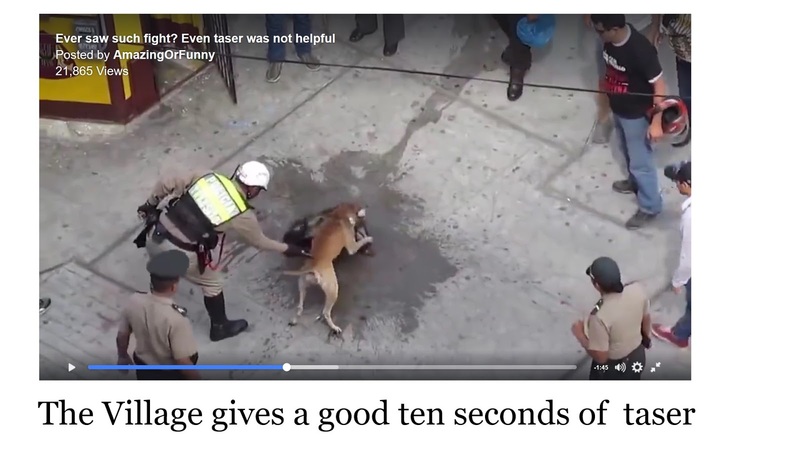 Neighbors came to their aid, eventually getting the dog to stop attacking by hitting it with a piece of lumber after using fists, a knife and a stun gun had no effect. 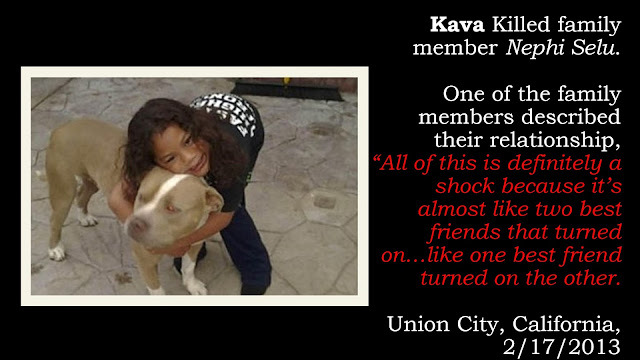 "It took the whole neighborhood to get the dog off," said witness Edgar Ramos. 2/15/2017 Houston, TX: Woman uses a plastic chair and protected the victim until help came. 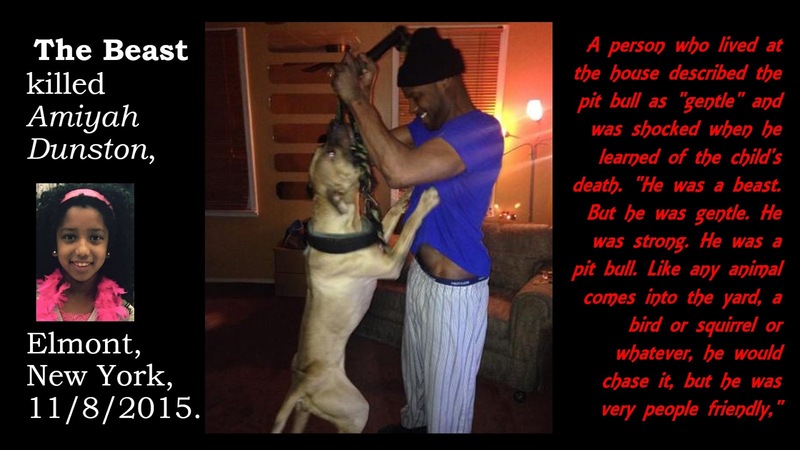 4/01/2010 A little tongue in cheek list of ways to defend oneself from a pit bull attack. 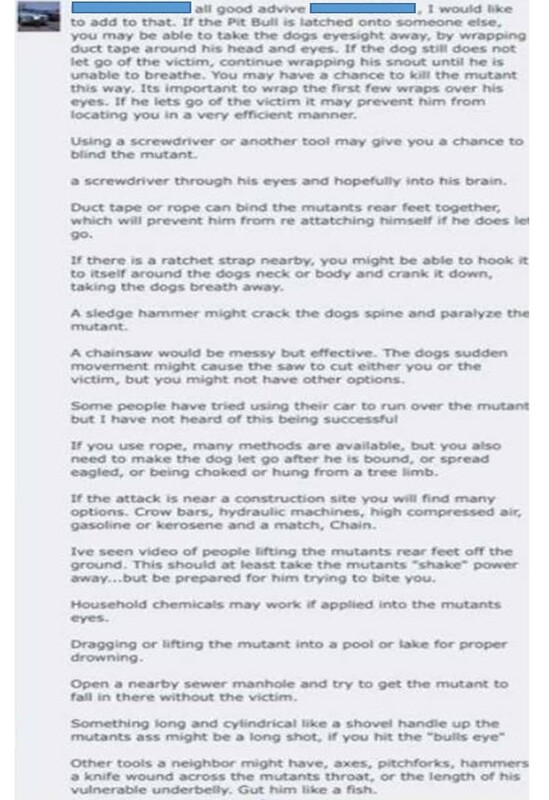 The same author created a response entitled "How to Defeat Someone Made Furious by How to Defeat a Pit Bull with Your Bare Hands. 6/27/2017 Inkster, MI Chainsaw and 2 X 4s used to ward off dogs mauling handyman in metro Detroit. It is the village who often pays for the medical and emergency team costs after a pit bull attack, especially when the owner of the dog can not be found or can not afford the expenses. It is the village who pays when an officer in the service of public safety must shoot a pit bull in the line of duty. There is always an investigation, and very often outage spread on social media. 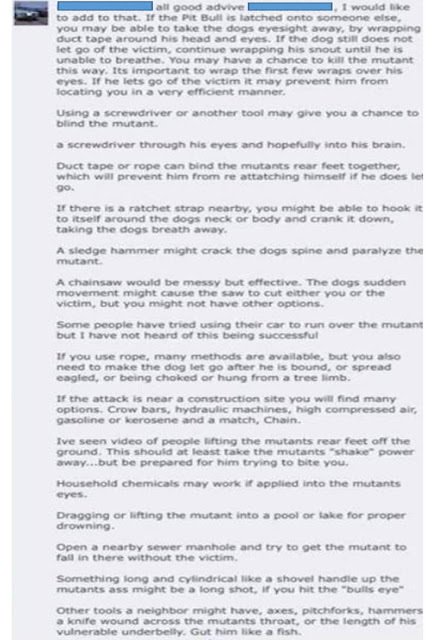 A fire man was demoted after posting a list of ways to defend oneself from a pit bull attack on a facebook page. Pit bull advocates quickly rallied outrage that he be fired, taking his suggestions out of the the "if you are attacked by a pit bull" context, erroneously that he was listing ways to kill pit bulls without the IF. They started a petition that received over 41,000 signatures. 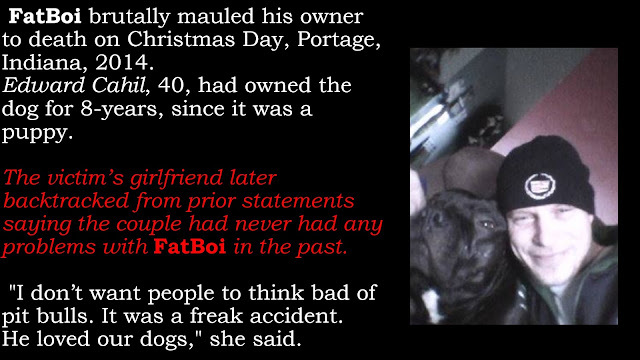 Through investigation, it was found that the fireman's descriptive, anti-pit bull comments caused the fire department to “lose pub­lic trust.” The administration also questioned if he could be able to deliver “com­passionate and professional” service to pit bull owners in the city who might someday need the fire department’s help. 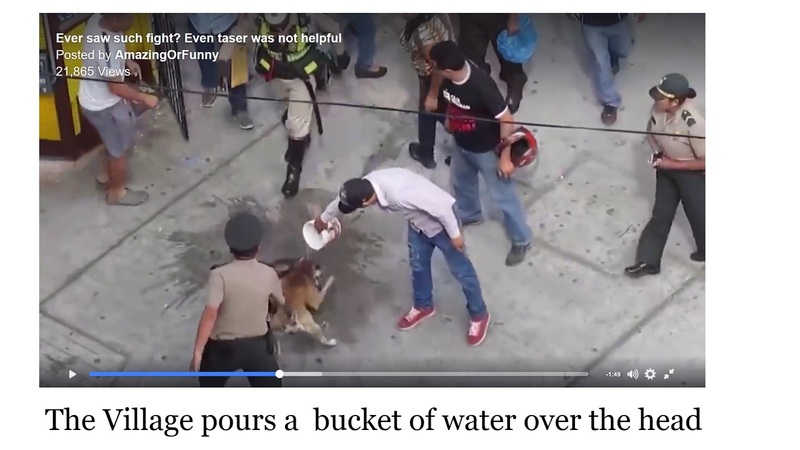 Additionally, the inves­tigation found, that he posted the comments on Facebook using a fire department com­puter and cell phones when he was supposed to be work­ing. only IF they are attacking. 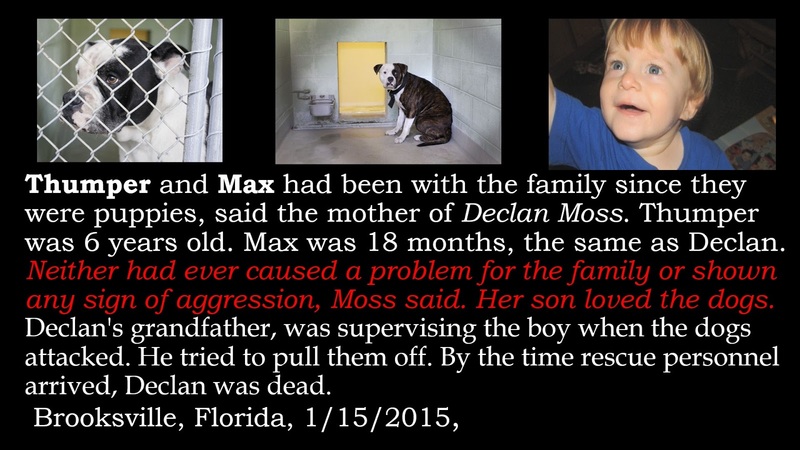 The investigation and sub­sequent discipline for the fireman provide a glimpse into an ac­tive subculture surrounding pit bulls, both for and against the breed. 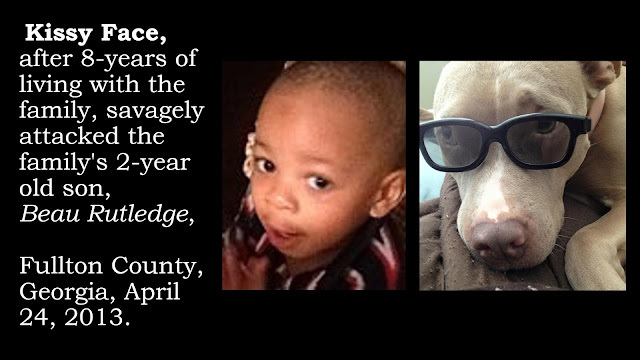 The original com­ments posted on Facebook group pages and a website that pro­mote the opinion that pit bulls are violent and unsafe, in a group discussion on best ways to defend oneself, or to help in the event of an attack. A former administrator of the Facebook page said he thought the fireman's detailed post was satire. 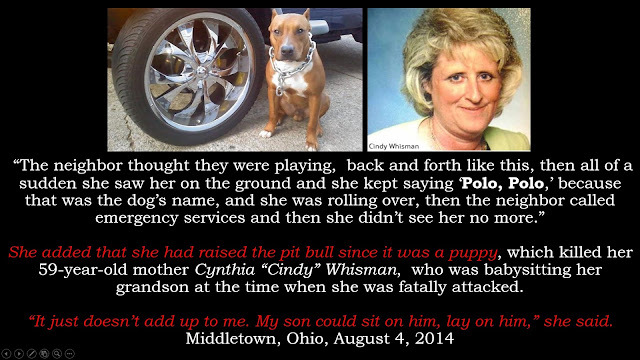 Unfortunately, the reality of a pit bull attack these days is real. 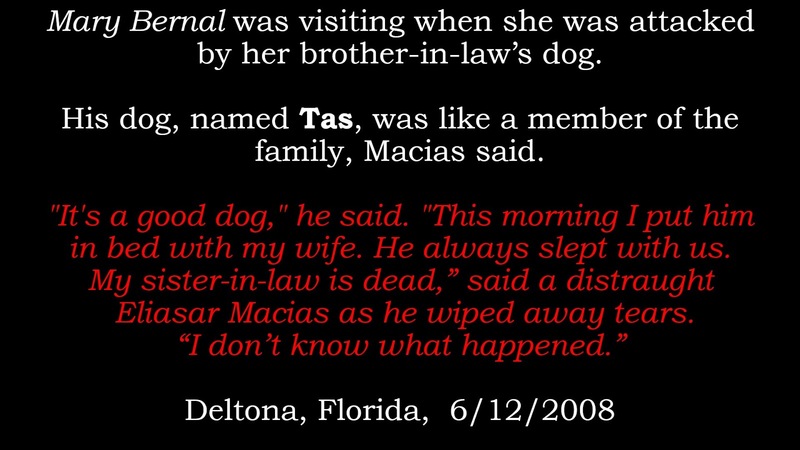 In this group, there were people who had REAL encounters, and dark humor is always flowing. 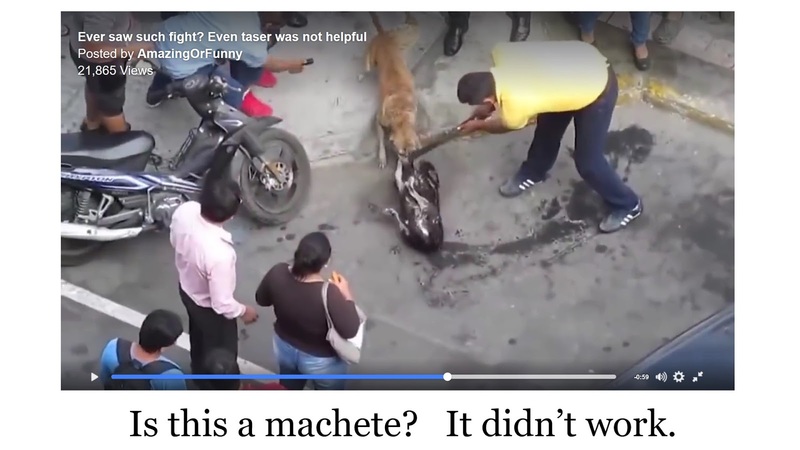 In the end, the one thing we need to remember in the event of a pit bull attack, or for that matter, an attack from any other being, human or animal, is that we need to use our BRAIN, to keep our wits and use whatever we can to defend ourselves. Unfortunately, we can't always defend our thoughts, when they seem cruel or politically incorrect in polite society. 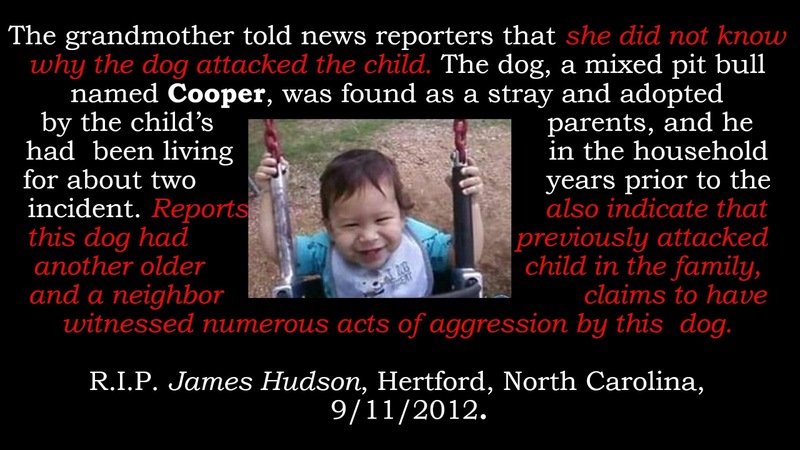 Is it something we should HAVE to discuss....ways to defend oneself from an attacking domestic pet? 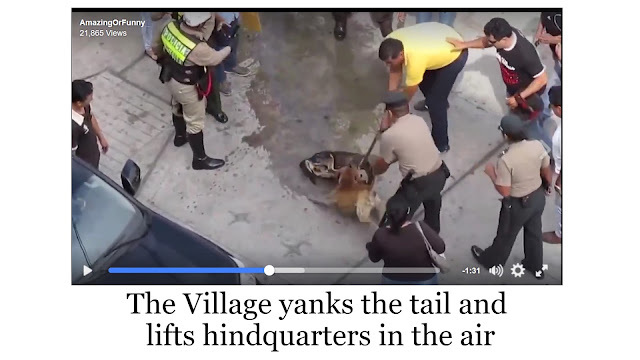 It is the Village who pays for the cruelty investigations, the warehousing of the unwanted dogs, and destroying thousands of them humanely. It's our collective heart that suffers when another life is horrifically and tragically taken due to dangerous dogs. It's OUR VILLAGE! We must do what we can to convince our civic leaders that we can not afford to give our Village to the dogs. 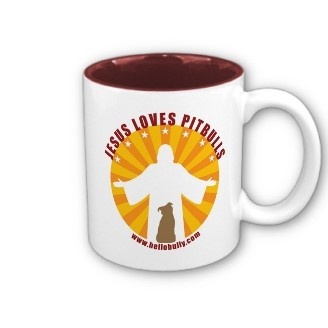 Jen Clyde argues in this blog entry for the Episcopal Cafe that Jesus would probably love pit bulls. 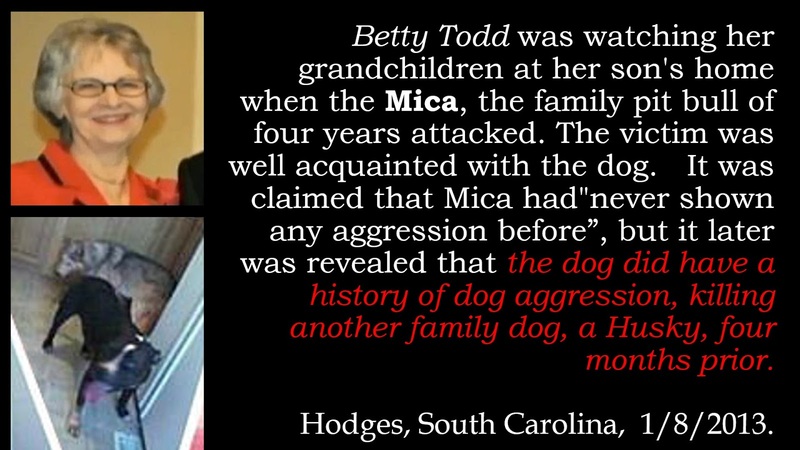 We find it strange she didn't use a single Bible Verse that mentioned dogs specifically, because it seems like the kinds of dogs that are used as metaphors in the Bible, appear to be pit bulls. 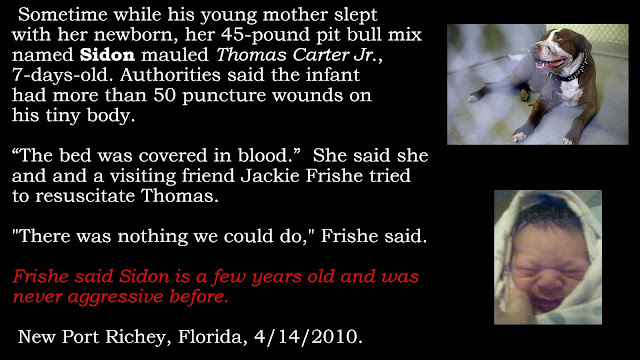 We also find it strange, there is no consideration for the people who have been victims of pit bulls. 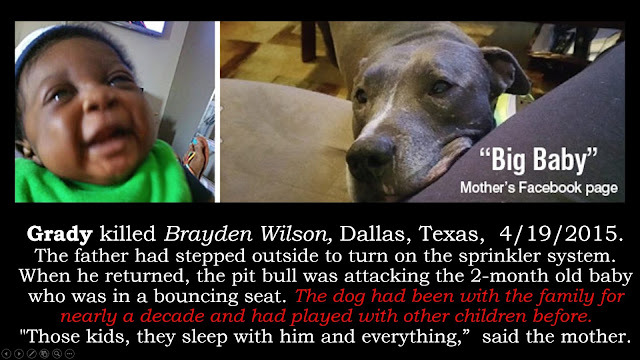 The people who hate American Bullies the most, would be the crowd that feels that American Pit Bull Terriers are the only true pit bulls. 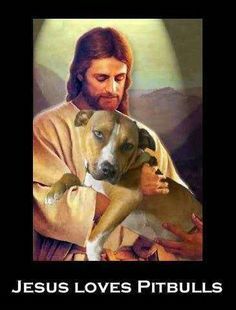 Jesus loves e-coli, fleas and mosquitoes too. 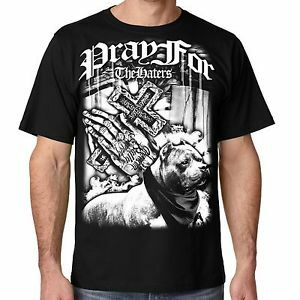 HENRICO, Va. -- On Sunday, a Henrico pastor said a man entered his church on Dumbarton Rd. with his pit bull and disturbed services. “I'm here leading worship and I can hear disruptive noises,” recalled Rev. Calvin Birch of the Lighthouse International Church, who stepped down from the pulpit to investigate. 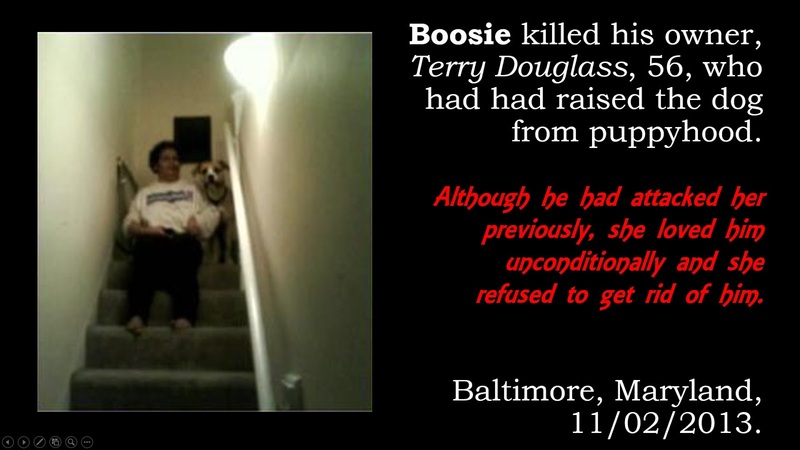 Birch said that people in the church grew fearful because the dog was roaming the church, and the man was disgruntled. 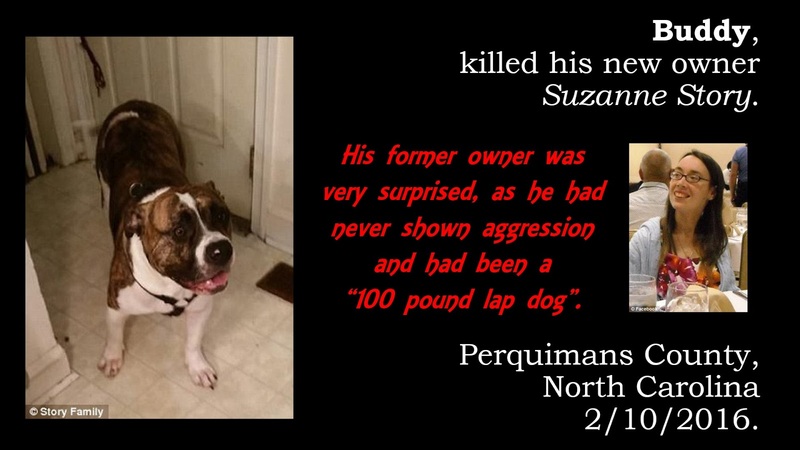 No one knew him, nor his intentions. Rev. 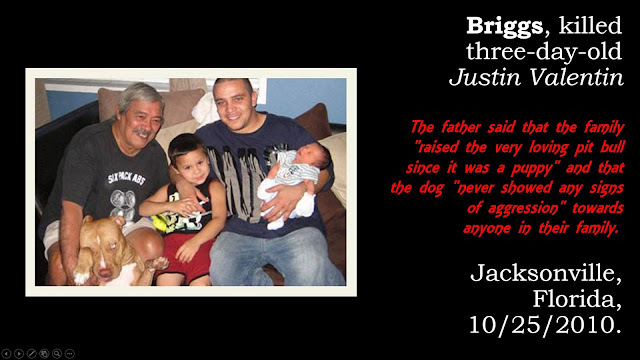 Birch said he and other church leaders asked the man to contain the dog and leave, but he refused. “He said no; he said the dog was friendly and that the dog would not bother anyone,” Birch said. Some church members stepped outside and called Henrico Police. Police told CBS 6 the man has not been charged because the animal was a service dog. Church members said the man never indicated that. “I will try not to find his motives, but his behavior was very unacceptable,” Birch said. Birch said he's glad that things ended peacefully on Sunday. 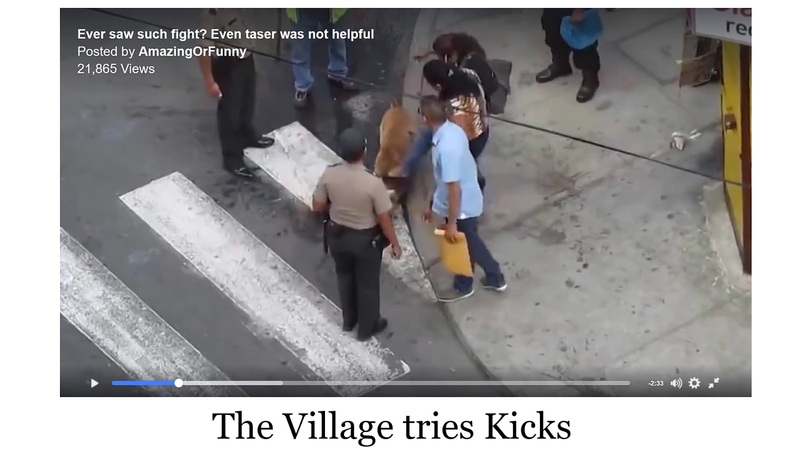 He said the incident prompted them to take a look at their security measures. He hopes that other churches, no matter how large or small, will do the same. 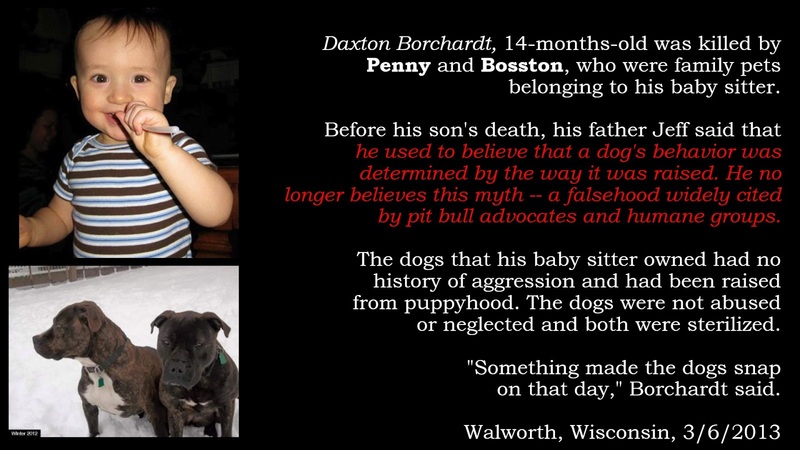 I have a confession to make.I broke down, and yes, I purchased that book Pit Bull by Bronwen Dickey. What will follow on this blog will be some thoughts, my own review, and I invite a discussion on this book, what was included, what was left out. I smell a regurgitation of the "Proof of Assertion" tactics employed by the well organized and funded pit bull apologia. If we create a thousand memes and say the same myths and all out lies a thousand times, it must be true. People so want it to be true, hose off the bloody sidewalks, say it again and again, and make it true. The author claims, it took seven years of research, interviews of 350 people including pet owners, dog breeders, dog trainers, animal control officers, dog bite victims (the rumor is, one) , as well as other experts in veterinary medicine, animal behavior, canine genetics, constitutional and criminal law, public policy, risk analysis, and health epidemiology. Like a good researcher, she looked at archival materials that spanned more than 250 years. And yes, it looks to be well organized, she has a table contents of 13 chapters I have yet to read, and I took a look at the bibliography, flipped through it and it has all of the trappings of a scholarly, scientific book. What little writing I have read, she has admirable skill. However, I'm not reading ahead, so I'm not going to pick her research apart just yet. My plan is to REALLY take it slow with this, and I'm going to grab on and chew over any of her concepts, each and every little word chosen, kind of like a pit bull. The choice of color for her cover was really well chosen. It's the the exact shade of red I call "Life Force" that stained my pants and my walls that night my dog was attacked by my neighbor's beast. It brings up that little movie again. As for the dog on the cover, it looks like a Stafforshire. 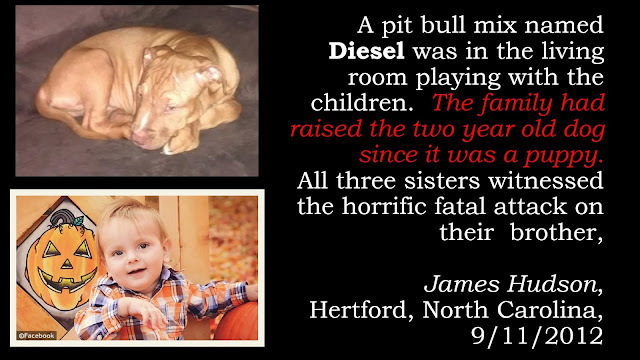 This will surely upset the crowd who think that only purebred American Pit Bull Terriers are pit bulls. 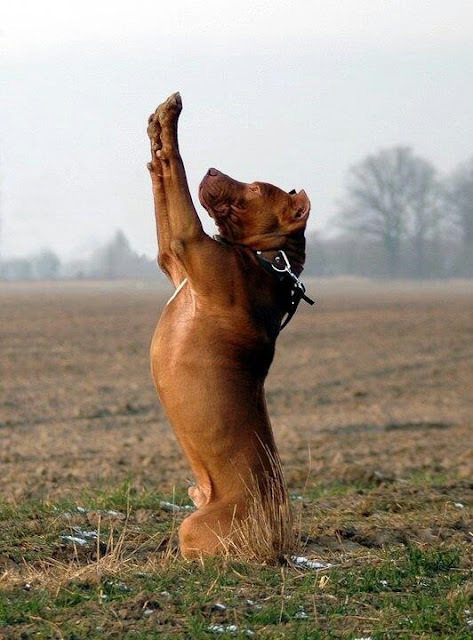 Had dogsbite.org chosen this image, there would be comments a mile long about how that isn't a real pit bull. It's ugly, and it gives me the heeby-jeebies. So let's talk about the title, and what it suggests. 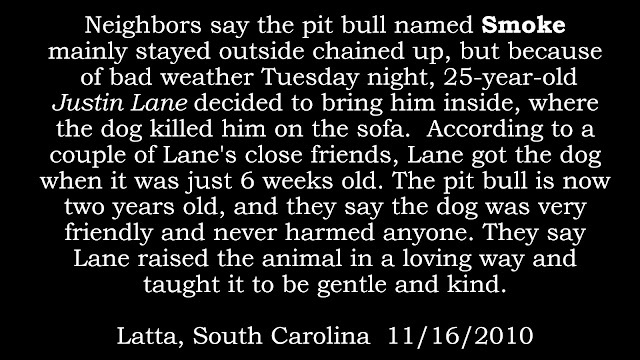 Pit bull, the Battle over an American Icon. 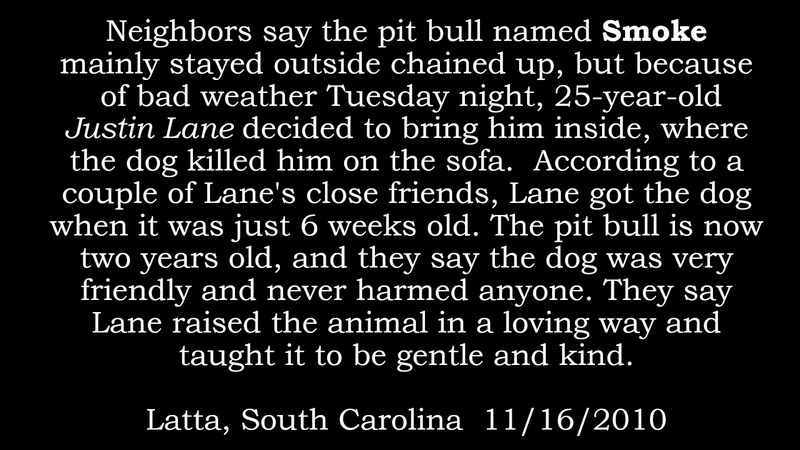 I wasn't aware of pit bulls, never thought about them once, remembered anyone mentioning them or seeing them portrayed as symbols that represented the United States of America. This, until my dog was attacked by one at a dog park. He wasn't killed that time, but was killed about a year later by a different pit bull type thing that lived down the block. I'm pretty old too. I've been around and I've noticed things, especially thing of an iconic American nature. I'm pretty much red white and blue, patriotic as can be. I used to march in parades, and as a young thing, could wield that iconic piccolo solo in "Stars and Stripes forever" and put people on their feet. What icons do I think of when I think of America? Eagles, the Liberty Bell, Uncle Sam, The Statue of Liberty, an American Bison, perhaps Mickey Mouse. I googled away, and found a good ten lists, and looked at the images conjured by my query, "American Icons". 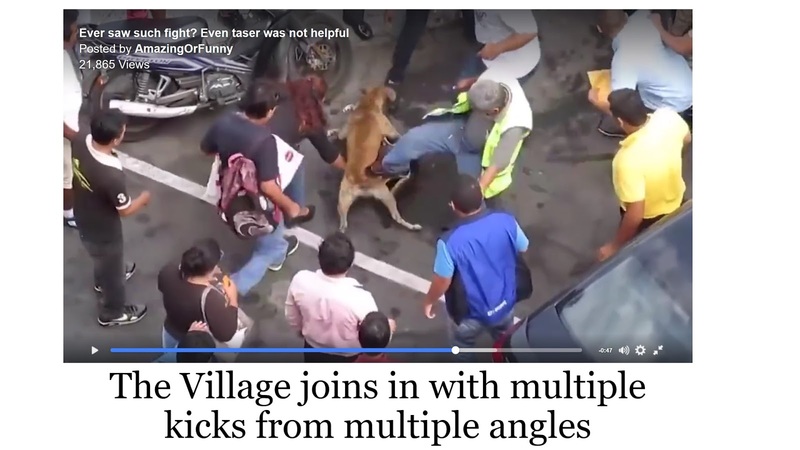 There wasn't even one dog among them, no less a pit bull. I'm not convinced it was ever an American Icon. 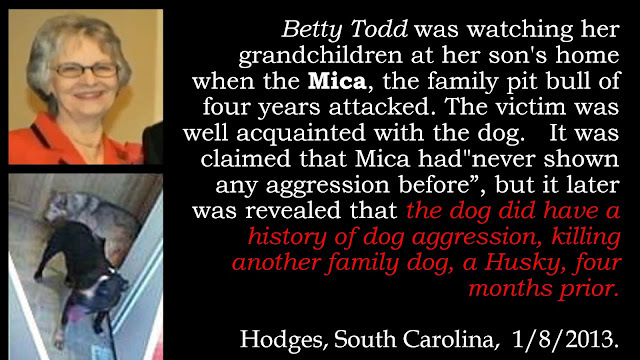 Who called it "America's Dog" in the first place, and when did this happen? 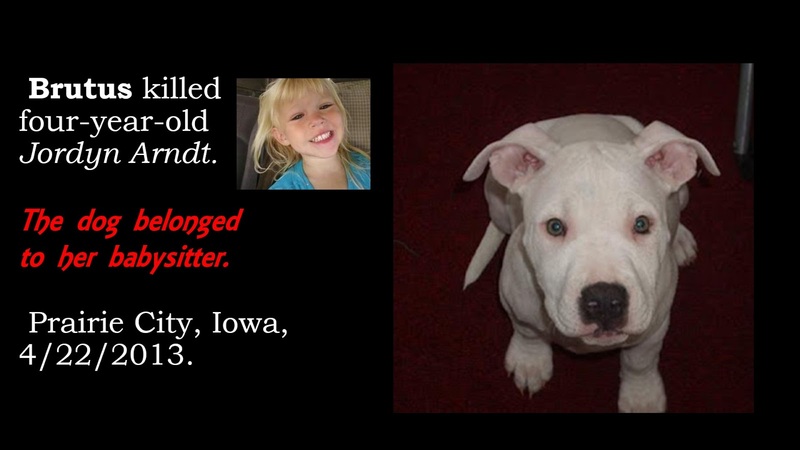 Does the pit bull as "America's Dog" have an official trademark@? Maybe Ms. Dickey will explain the origins of this moniker. I am suspect they came from the very source who named them "Nanny Dogs". As it is, weren't they created in Merry Olde England for the purpose of Blood Sport? 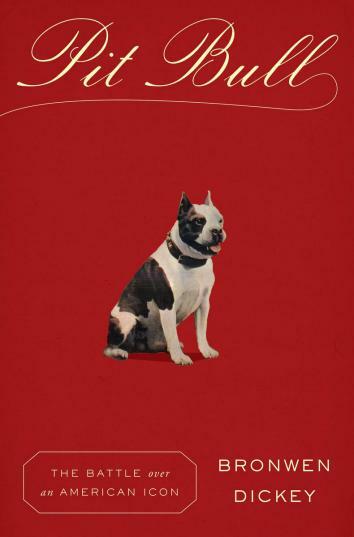 If you were to look for British icons, perhaps we may find an image of a grumpy faced Bulldog with a stiff upper lip. On the back, goody goody, the daughter of a well respected writer, managed to get some praise from some really big wigs. I suspect she had some help from some insiders in the publishing industry, I suspect she may have been cherry picked for this writing and that it would make lots of money, CACHING! 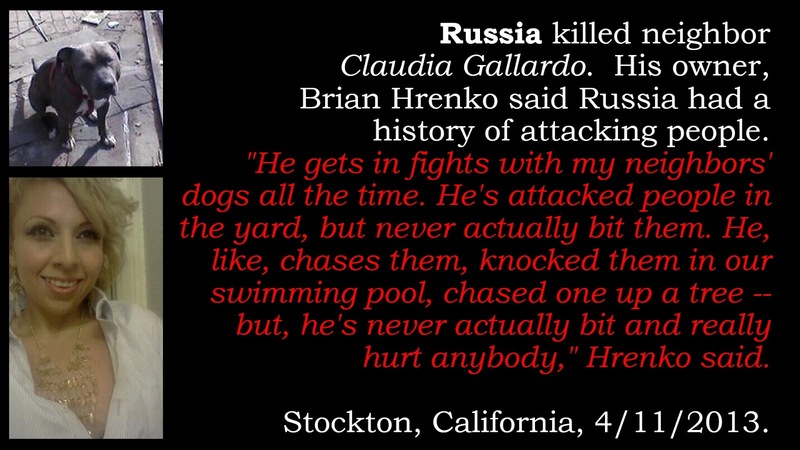 If this is the thesis statement of her book, what should follow is her explanation of how this dog is an American Icon, of which, I'm not convinced, and how there is some "battle" over it. I'm opening the to the inside jacket, perhaps there is more explanation. 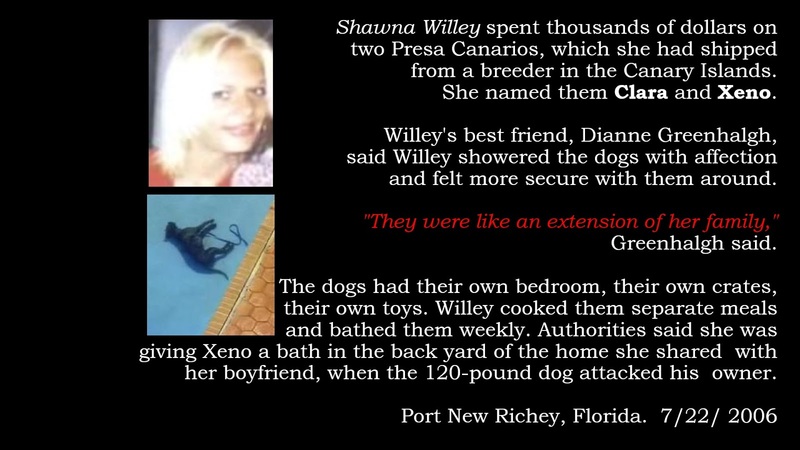 How can we prove that the pit bull was ever a popular breed of dog? 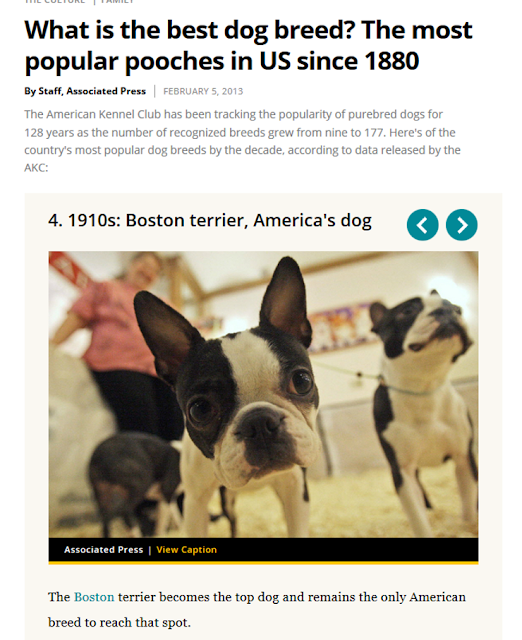 According to the very well respected Christian Science Monitor, it was the Boston Terrier that is America's Dog and the darling of the turn of the century. The American Kennel Club has been tracking the popularity of purebred dogs for 128 years as the number of recognized breeds grew from nine to 177. Here's of the country's most popular dog breeds by the decade, according to data released by the AKC. 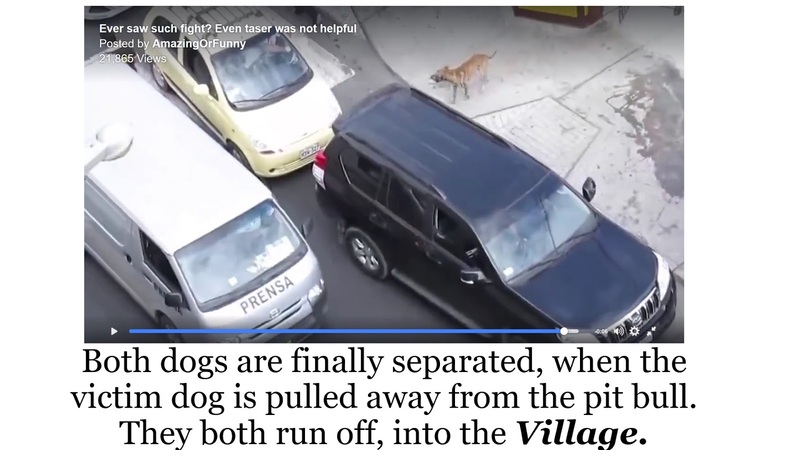 The Labrador Retriever has been no. 1 for over twenty years. Pit bulls are not even on the top ten. I know there are other bloggers and researchers who have covered this same material, the claim that the pit bull has been an American Favorite at one time. 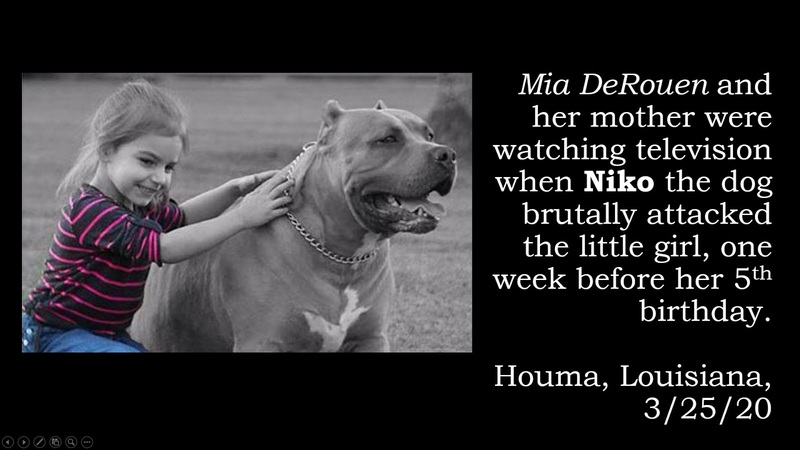 Until they became the politically correct statement du jour, pit bulls have only been popular as fighting dogs. 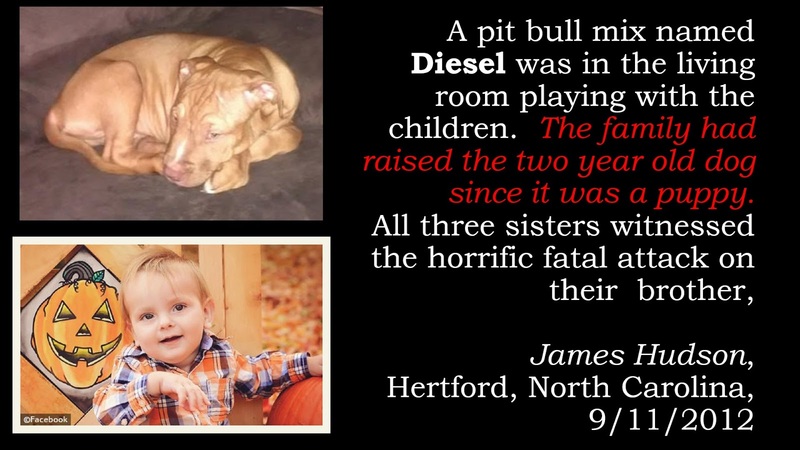 It's currently estimated that pit bull types represent 6 % of the population, but represent over 60 % of serious and fatal dog attacks. 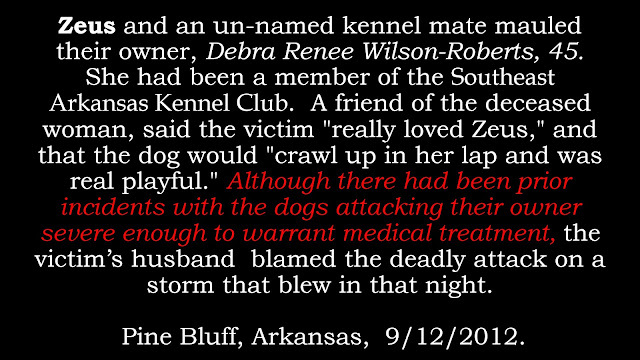 If dog attacks, especially serious and fatal attacks were represented by popularity, then the majority of these attacks would be by dogs that are equals to pit bulls in size: Labrador Retrievers, German Shepherds, and Golden Retrievers. This is not the case. 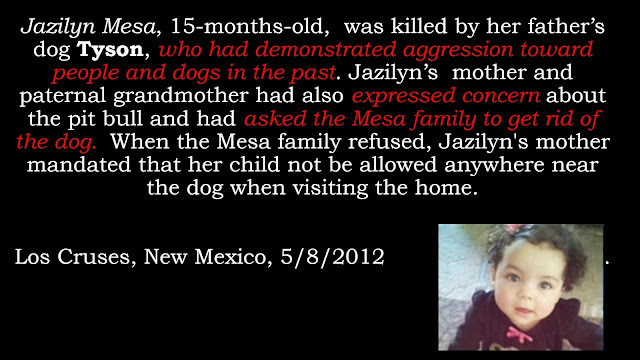 I'm now stuck on this phrase: "The dog has become the most demonized and supposedly the most dangerous of dogs". Supposedly. Ask your insurance agent. 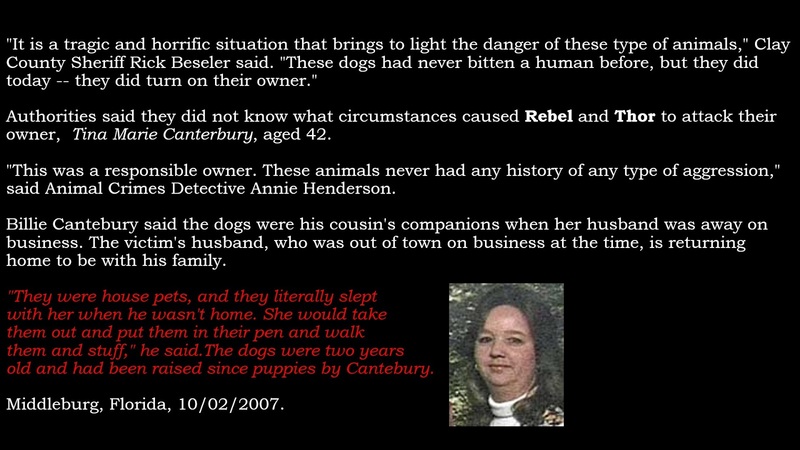 They have a number for the "supposedly most dangerous of dogs" figure. Ask the surgeons who sew up survivors. 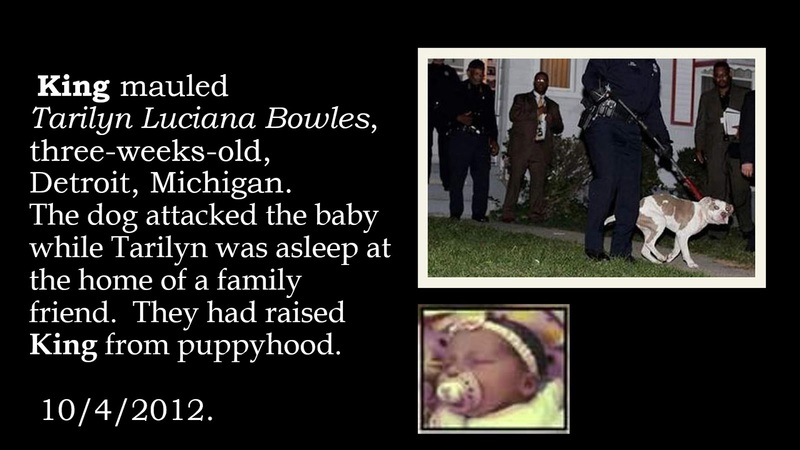 I inquire too, if being supposedly dangerous is something that can demonize it. 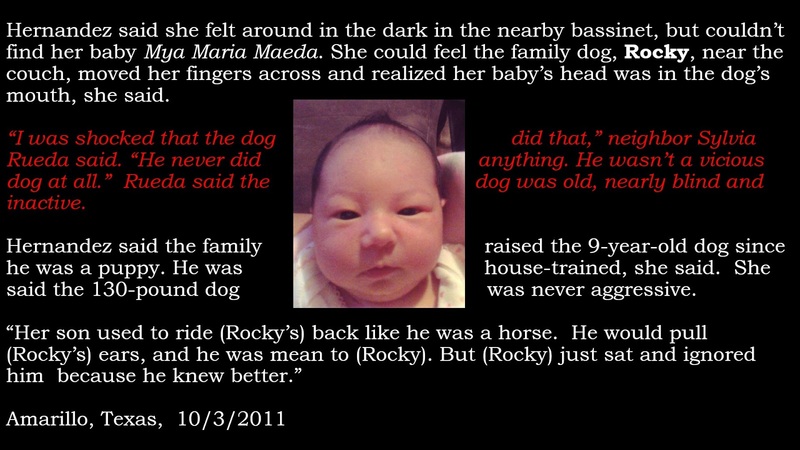 Horses are dangerous, are they demonized? Wild animals, Bears, Sharks, and Tigers, all dangerous, but also not demonized. 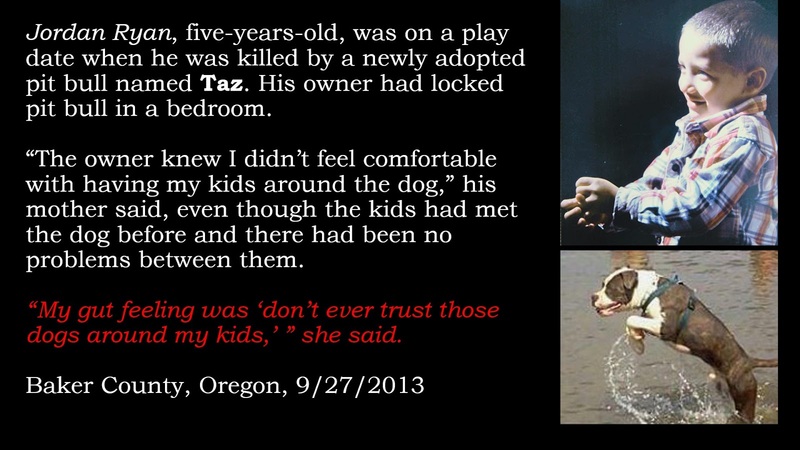 We expect wild animals to be dangerous, we don't invite them to live with us as pets. Pit bulls kill more people in the U.S. than Sharks do, they kill their owners, without warning. 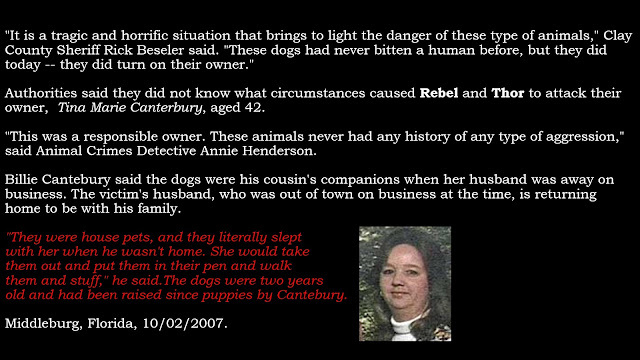 Dogs that were bred to take down the inherently dangerous bull, supposedly dangerous. 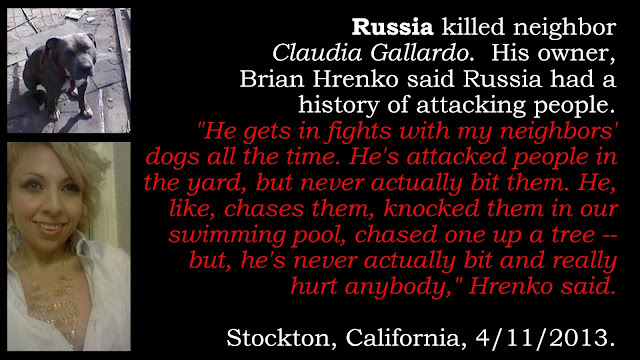 Dogs bred for blood sport, to kill their own kind, supposedly dangerous. They maul and maim countless others, humans and other animals alike. Consumer products are pulled for less injury and death, is it due to supposed danger? 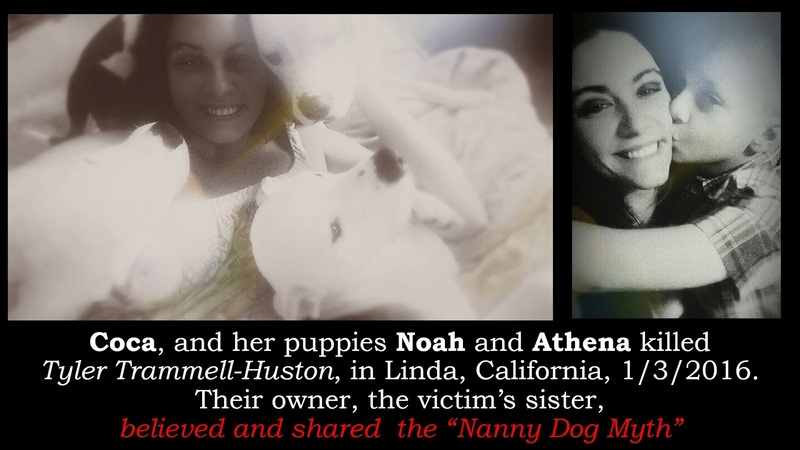 Since the release of Ms. Dickey's book, in May 2016, the following people have been killed by the supposedly most dangerous breed of dog. Supposing all of these people, now in repose, what would they say about supposedly dangerous pit bulls? During this same time, there were many serious attacks on people. There were also many serious and fatal attacks on other animals. Supposedly, they should count too. 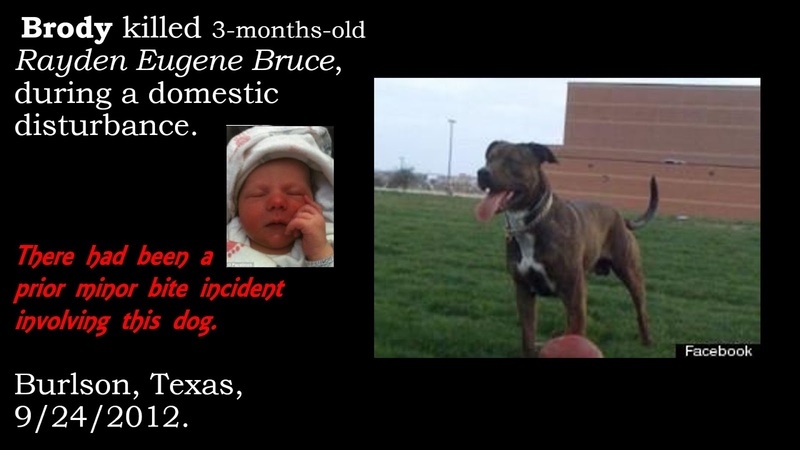 it just like that, sans breed. 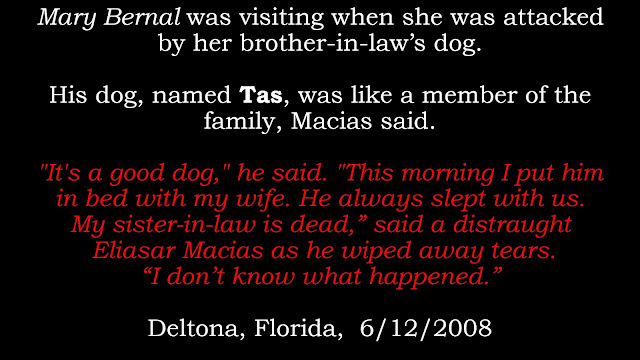 testimony of the scene encountered in the aftermath. wuddly curs, then just once, they went game. 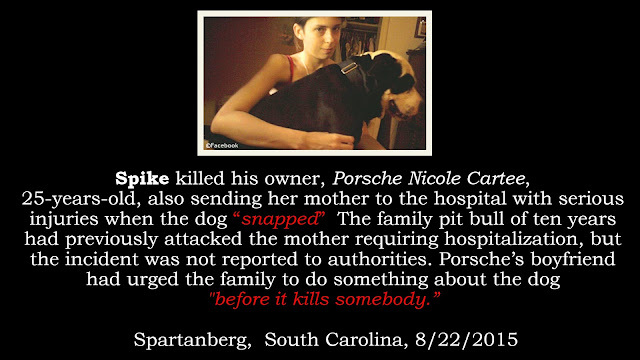 *Butch killed his owner Michael Cook, who didn’t survive the double amputation. Isis Krieger while playing with the child. Just before the incident, the Michael Naglee was being held by Louisa Farmer, Michael's maternal grandmother, while she sat on the couch. 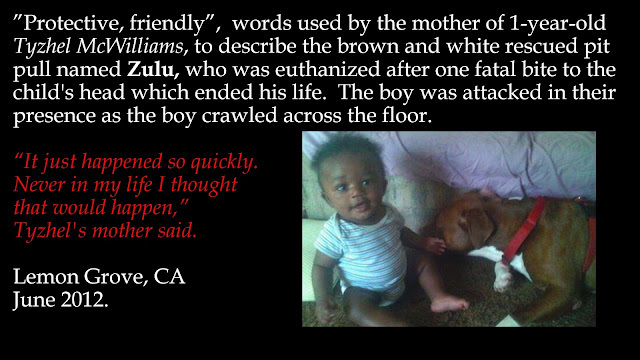 After Michael began squirming, she placed him on the floor. 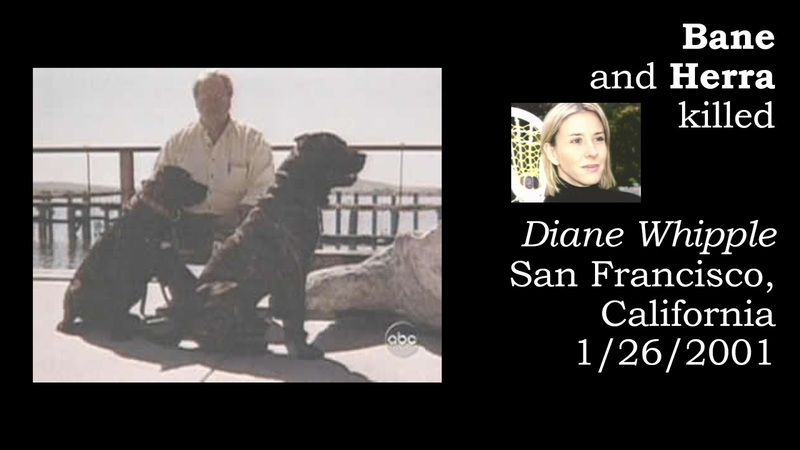 He then "ran across the room to *Duncan," according to Michael Farmer. 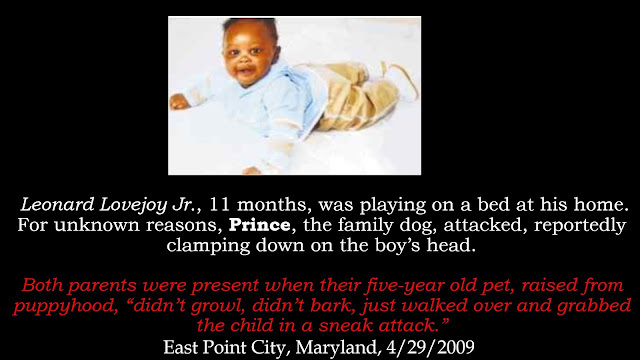 The dog responded by knocking the boy down and attacking him and three adults who intervened. 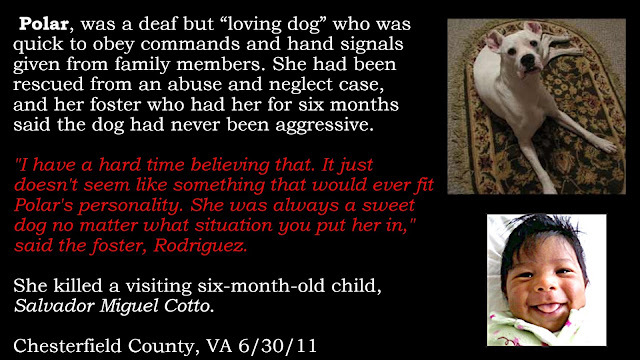 The couple got the animal at a shelter about four years ago. 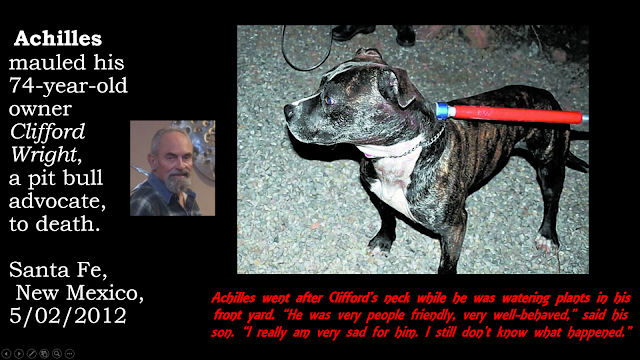 The dog, a 135 American Bulldog Mix, was shot dead on scene by responding deputies.Oregon City, Oregon, 4/3/2011. window of his pick up truck. New Albany, Mississippi, 11/6/2009. * Honey killed Joseph Hines, 58, , who had rescued him five years prior, Burnettsville, Indiana, 12/5/2011. 2-year old TayLynn DeVaughn was viciously attacked and killed by a family pit bull-mix named * Jake, while visiting her aunt's home on Fleetwood Drive in West Mifflin, a Pittsburgh suburb. 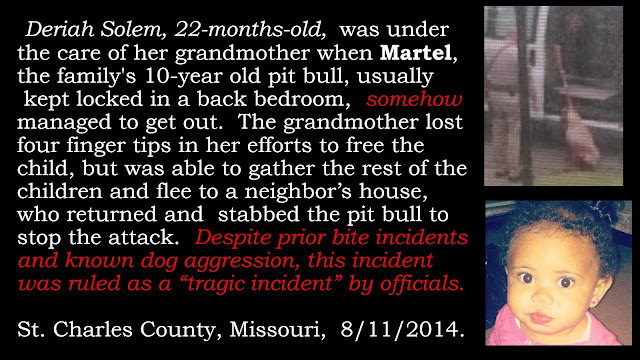 The pit bull belongs to her aunt's boyfriend. *Molly, a supposed pit bull/Airedale cross used for hunting pigs, killed Vincent Scardina, Carmel Valley, California, 3/1965. * No photograph could be found of the named dog. All of these dogs are innocent, because they were only doing what they have been purposely bred to do. Nearly every one of them paid for the crime of being promoted as family pets, most humanely euthanized and their heads cut off to discern if there was rabies. Not one of them had rabies, but every single one of them had something as deadly called gamebred D.N.A.. Some of them were shot or stabbed by police, a neighbor or even a family member. 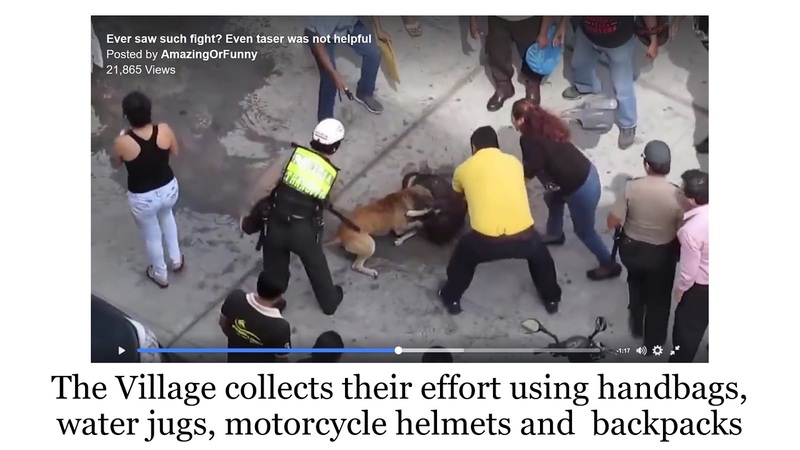 All of them had more humane deaths than the ones in which they had just participated. 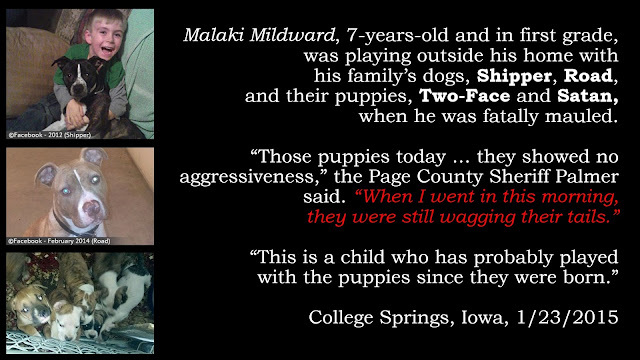 Please remember the people who owned these dogs when you utter the phrase, "it's all how you raise 'em". It's the bloodiest lie spread by the pit bull advocacy. 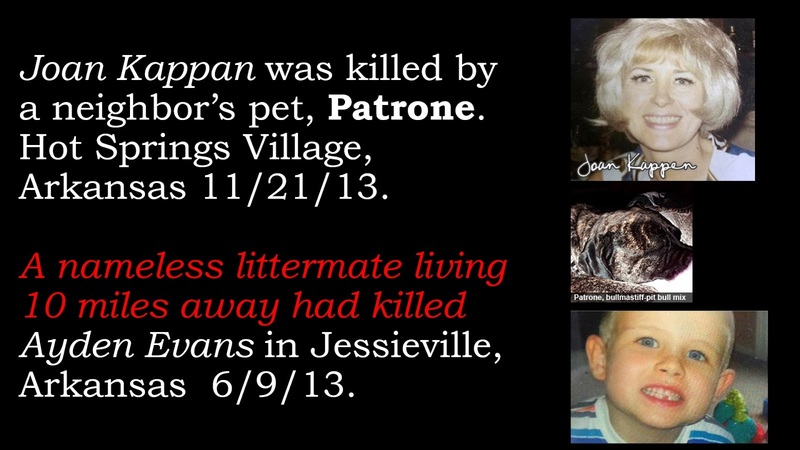 Who are the real killers, what are their names? You will know them by the misinformation they spread, racking up more and more victims, more and more dead. 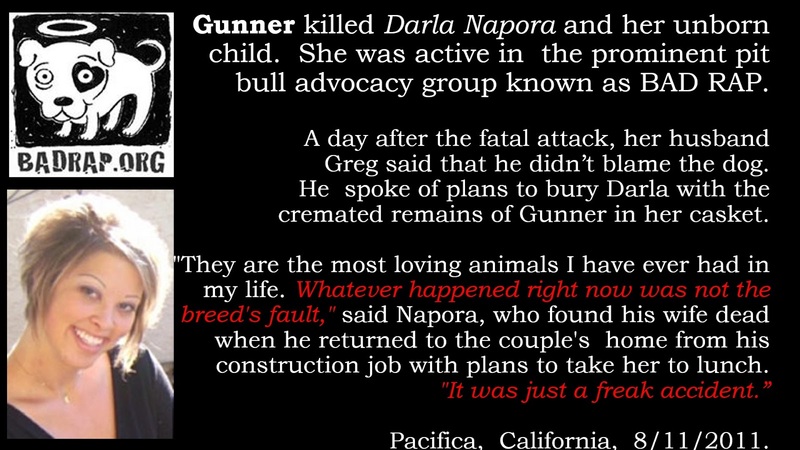 They call themselves pit bull and animal welfare advocates. We don’t need to mention their names, you know them well.